The tastefully furnished holiday flat has one bedroom, with either one double bed. The living/dining area is modern and spacious and there is a double sleeper couch for two more people available. For entertainment one can make use of radio, CD player, TV and DVD. The kitchen is fully equipped with hotplates, microwave oven and grill. There is a shower in the bathroom. From the balcony one can enjoy a magnificant view over the valley and the bay. Gardenfurniture is available to spend relaxing hours. 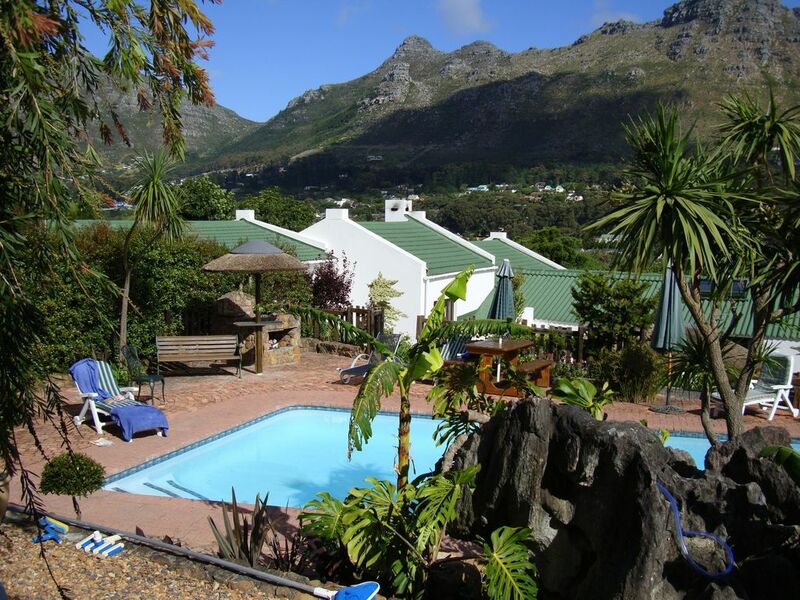 Modern and comfortably furnished, self-catering apartments and one garden cottage for two, two to four or four to six people in a quiet residential area of Hout Bay. They are set in a big garden with a large pool and outdoor barbeque, offer secure off street parkin. From the balcony or the terrace one has a magnificent view over the surrounding mountains and/or the bay. Your hosts Erik & Elke are Germans and have been living here for more than thirty years. If you are interested, they can assist you with the planning of your daytrips and can take you on sightseeing tours. They also offer airport transfers. Hout Bay is a picturesque fishing village surrounded by mountains with a long, white beach and a delightful little fishing harbour. The village offers charming roadside cafés, international restaurants as well as a wide range of interesting shops, numerous sports facilities, the largest bird park in Africa and enjoyable hiking trails. On the 'Village Green' is every Sunday a craft market. Along the green slopes of Table Mountain one gets to the popular botanical park 'Kirstenbosch Gardens' were one can enjoy during the summer month outdoor concerts. Cape Town City, the entertaining 'Waterfront' and the famous Table Mountain are within 20 minutes drive along the scenic coastal road. Cape Point and Cape of Good Hope can be reached within one hour drive via the scenic coastal road 'Chapman's Peak Drive'. Well known places like Stellenbosch, Paarl and Franchhoek in the Cape Winelands are only one to two hours drive away.